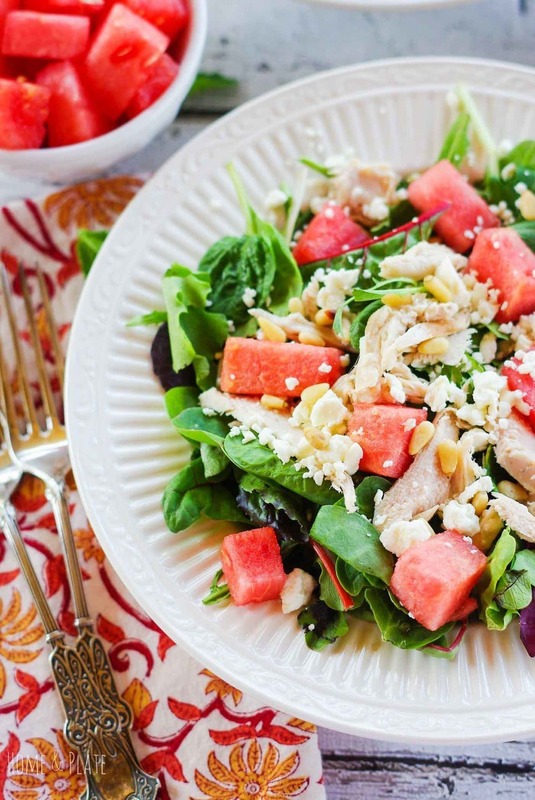 Beat the heat this summer with a light and juicy salad featuring watermelon as the main ingredient. My father-in-law always enjoyed his watermelon with a sprinkle of salt. I never quite understood how that could taste good until I discovered the delicious combination of watermelon and feta cheese. The two ingredients are delicious together but even better nestled on a bed of spring greens and topped with juicy grilled chicken and crunchy pine nuts. My family is trying to incorporate more fruits and vegetables into our daily lives. With summer arriving, watermelon is easy to find at the grocery store and the price is right. Now don’t get me wrong, we eat a lot of watermelon just the way it is all summer long. One of my favorite ways to enjoy this sweet fruit is from the rind but I also like to blend it and use it in my favorite drinks. Be sure to check out my refreshing watermelon lemonade slushies for an irresistible summer beverage. Watermelon also serves as a wonderful ingredient paired with prosciutto for an easy to make appetizer that will have your guests asking for the recipe. 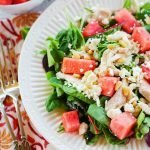 Getting back to the salad, the sweetness from the watermelon paired with the salty, creamy taste of the feta cheese is a taste you shouldn’t knock until you’ve tried it. I’ve been getting into the habit of grilling more chicken than I need so I have it throughout the week to toss onto a salad just like this one. The added protein fills you up and makes for a complete meal. Perfect for lunch on hot and sunny summer afternoon. 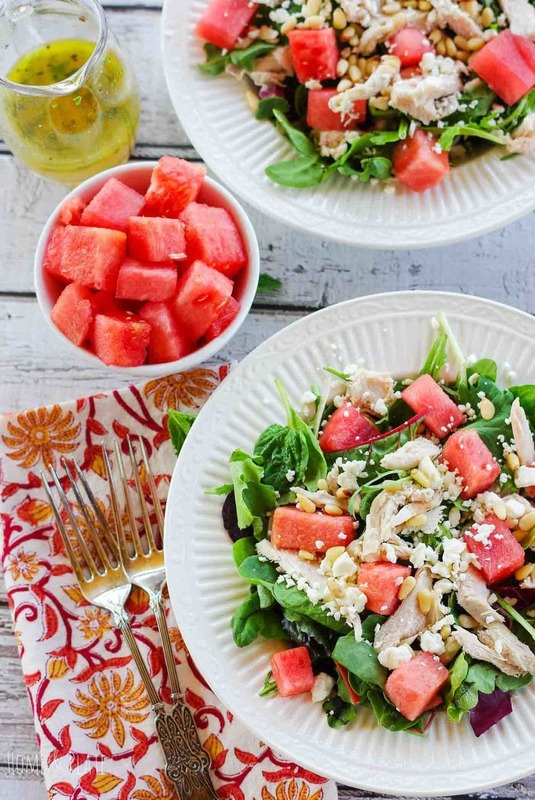 Salty and sweet, this watermelon chicken salad it's a perfect way to enjoy a light lunch that's packed with protein and vitamin C.
Place the greens in two salad bowls. 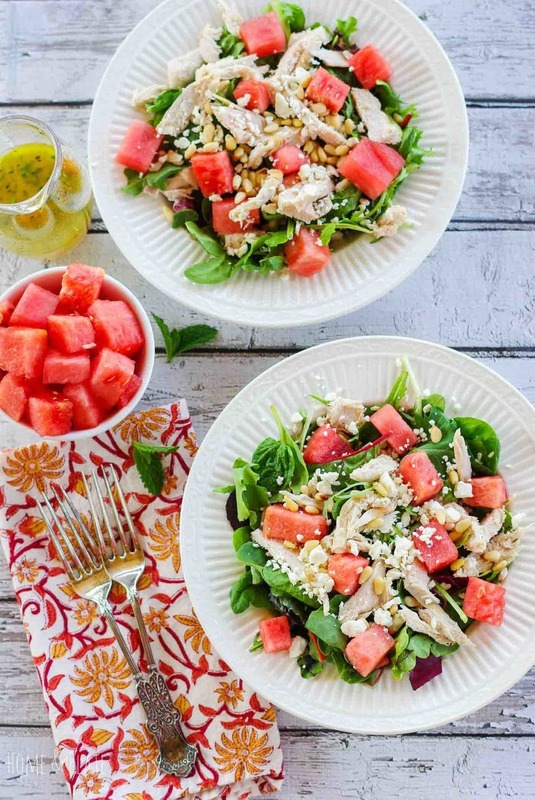 Top each bowl equally with watermelon, pine nuts, feta cheese and grilled chicken. To make the vinaigrette, whisk together the lime juice, honey, olive oil, garlic, fresh black pepper and mint leaves. Drizzle over the salads and serve. 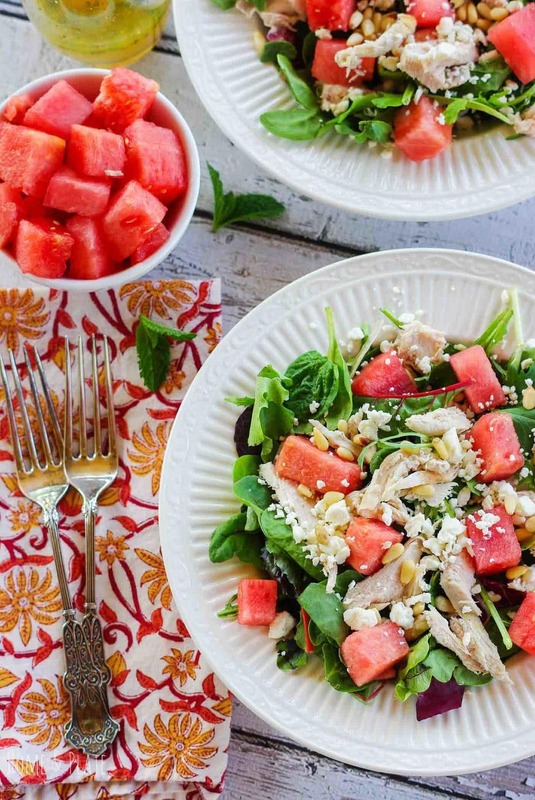 Watermelon is such the perfect summer food! I love it in salad too, especially paired with pine nuts. What a great meal for those hot days that are already in full force over here! Thanks Sophia:) It is the perfect summer food. We just don’t eat enough. I feel like I am always buying watermelon. Gotta eat it while its in season. 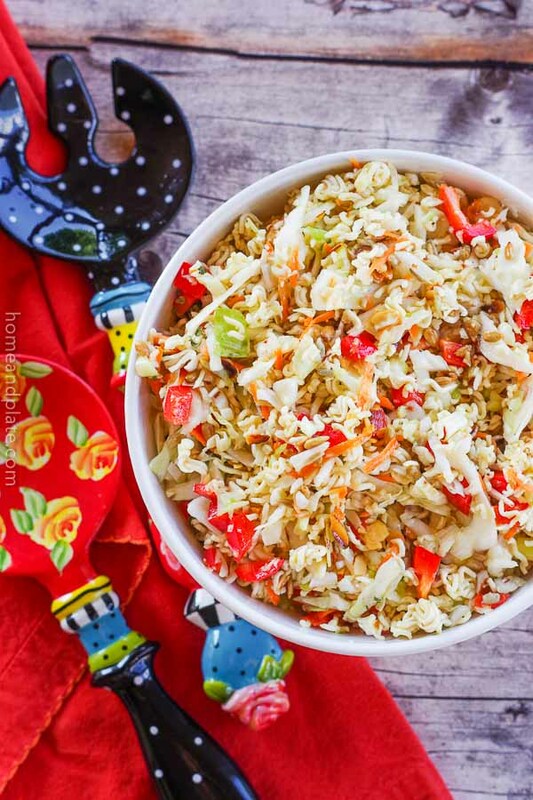 I love this combination, and you are brilliant for adding chicken, I want it for dinner tonight! Thanks Sue…the chicken adds the perfect punch of protein to fill you up. This is so colourful and vibrant!! Love this salad so much, I wish it was dinner tonight! Melons and salt is so classic, glad you’ve now embraced the flavor combination. Your salad is absolutely beautiful! What a beautiful and delicious looking fresh summer salad!